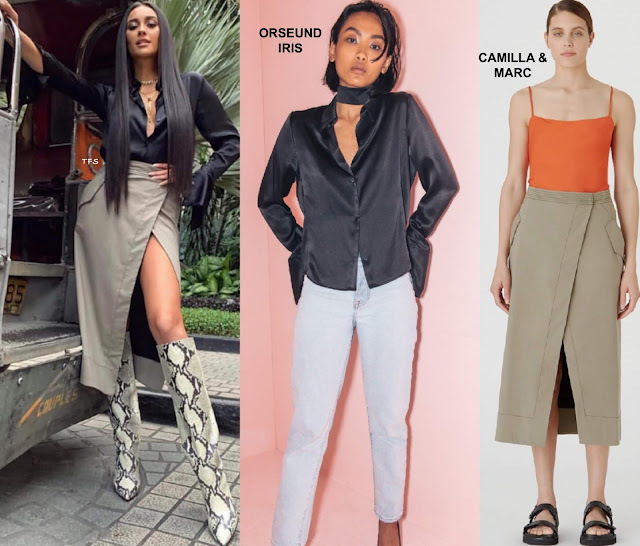 Shay Mitchell is out in Manila and the actress showed off a sultry, edgy look via her instagram page yesterday(January 17th). She posed for the gram rocking a ORSEUND IRIS black silk, wide-cuff shirt and the CAMILLA & MARC 'Mead' wrap, split detail skirt in normandy grey. The PARIS TEXAS snake print knee boots, upped the chic appeal of her look. She topped off her look with a flawless beauty look and gold jewelry. Are you feeling Shay's instagram style?